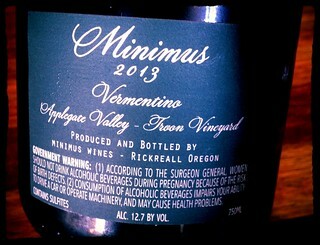 Word of Minimus Wines, located in Oregon, came my way via the Northwest Wine Anthem. So when I saw one of their offerings, a Vermentino, available by the glass at Seattle’s Matt’s in the Market, I pounced. What a fantastic lunchtime wine. You don’t often see domestic versions of this Italian grape (aka “Rolle” in France), so the stars aligned concerning both a producer and a variety I wanted to know more about. I love the front of this label. It reminds me of an entry from an old encylopedia. And if anyone gives me guff about noontime imbibing, I will just turn the label their way and ask them to politely to stop interfering with my studies. Troon-ly a fine site for Vermentino in Southern Oregon. 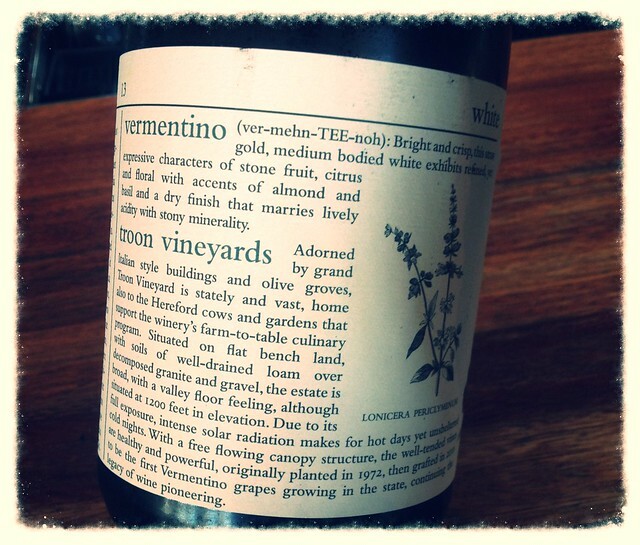 I’ve previously had Vermentino from the same spot in Oregon–produced by Troon Vineyard themselves–which I would recommend getting as an interesting comparison. And if you get to Matt’s for some daytime wine drinking, for which the 12.7% alcohol Minimus Vermentino is ideally suited, get the Cobb-esque salad, which has the wonderful touch of coming with deviled eggs instead of the tratiditional hard-boiled. Are you hankering for more Southern Oregon wine knowledge? Check out not one, but two podcasts. The first with Clive Purshouse of the aformentioned Northwest Wine Anthem. The second with guest Herb Quady, Winemaker at Quady North.